A novel about a fairy in (and out) of our everyday twenty-first-century world. Lethe Press, September 2014. A finalist for the Third Annual Bisexual Book Awards in Speculative Fiction. Winners to be announced 30 May 2015 in New York. Artwork: Ben Baldwin. Design: Alex Jeffers. Liam missed the school bus. Deliberately. From the far side of the rutted athletic field he watched the yellow monster trundle away with its monstrous cargo and pulled out his phone. When he flipped it open, the animated carrousel of tiny family-n-friends photos-n-unassigned-icons spun for a second before it settled on his dad grinning up at him. Dad #1. They’d been fighting, but still. One kept up the forms or got grounded. Liam thumbed the call key and lifted the phone to his ear. Growing up in rural Massachusetts, Liam Shea is very well aware of being different from other high school students. It’s not just having a gay dad that draws the bullies’ attention. 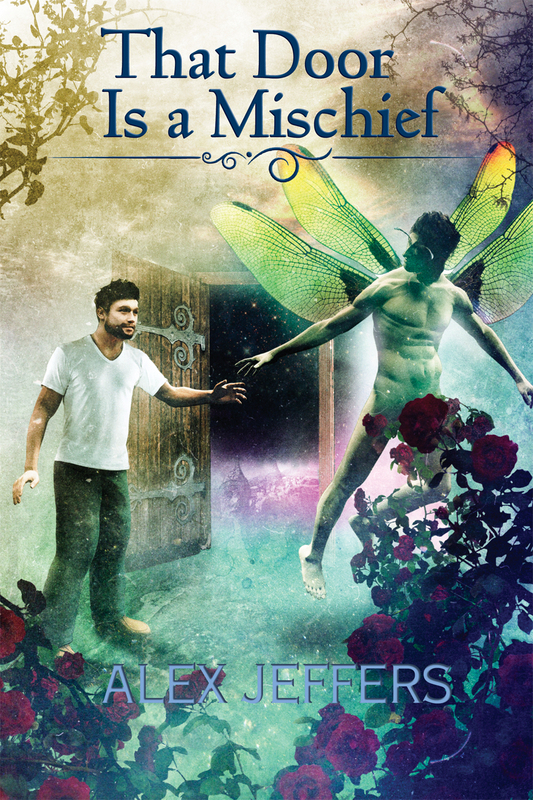 For Liam is not an ordinary earthbound, timebound boy but a fairy. An ethereal creature with great glowing golden eyes, dragonfly wings between his shoulders, and an allergy to cold iron. When an emissary from fairyland opens a magical door, teenage Liam chooses not to accept the seductive invitation of the unchanging lands, not to abandon his loving father as he was abandoned by his own kind. How will a fairy live in the twenty-first century (and beyond), seeking balance between inconstant mortal concerns and his own nature? A fairy’s nature is not to change. Or is it? In the human world of bullies and best friends and lovers, perhaps not. The door to the twilit country will open again, the airs of his native place call, the whims and instincts of his own folk ensnare him. Few choices there are any person—even a fairy—may face only once. In this story of a fairy child adopted into a gay family in our own world, Jeffers slides seamlessly between impossible and all too probable, creating both in luminous, extraordinary prose. This is a novel of aching love and perfect loss, amazing and utterly unforgettable. Alex Jeffers’s prose crackles with the wild magic of fairyland, but ultimately this compelling, haunting novel is about the fragility and resilience of the human heart. What a beautiful, beautiful book this is: haunting, romantic, powerful, and perverse. Alex Jeffers is an amazing storyteller and a master stylist. Jeffers has a remarkable prose style. His words flow effortlessly through the pages. His vivid imagination of Fairyland is beautifully crafted. Jeffers has created an intricately woven fairy tale of acceptance, love, and the search for oneself. Highly recommended. I don’t know how to recommend this book. It is certainly supernatural fantasy, fairies, fairyland and all, but it felt so real. The characters come off the page, like people you know, fallible, damaged and exceptionally beautiful people, exposed and broken and still lovable just like your own friends. The sense of wonder Jeffers creates when people really see Liam, see the world around them differently, stuck with me. If you were going to read a fairy story anyway, read this one. If you only wanted a window into the lives of people so real you think you might pass them on the street, read this one. If you want to utterly lose yourself inside someone else’s massive world changing love, then read this book. If there is an overarching theme, I think it is this: Liam, despite being an amoral, physically powerful being, is as affected by love as any human. And fairy love can be as intense as human love—perhaps more so. There is beauty and sorrow in this tale. The fantasy and the reality in Alex Jeffers’ world of men and fairies merge into one until the reader becomes immersed in his characters’ lives—pieces of life reflecting the passing of time as they encounter the light, dark, and all the grey areas in between, including love, passion, and loss. That Door is a Mischief is a remarkable read full of magic, wonder, and terrible beauty. Highly recommended. Alex Jeffers is a master of his craft, a wordsmith on par with any of those names you were forced to read in university and then sat there, thunderstruck, at the last page thinking, why doesn’t everyone know this author? …if you’re at all a lover of speculative fiction where our world intersects with something ‘other,’ then you need to do yourself the favour of finding a copy of That Door is a Mischief. Open it. Step through. You won’t be same, but then again, with magical doors that’s always the point. Clocking in at a scant 200 pages, but full of unparalleled joy and bone wrenching sadness, That Door Is a Mischief is, ultimately, a highly enjoyable work of fantasy fiction. Back in 2010 when I started writing a story about a fairy raised by humans in present-day Massachusetts I intended a one off. But before I’d got very far it became apparent Liam Shea wanted more than one 6,000-word story. So I did a little advance planning. Very little, truly (my muses don’t take well to micro-management): a matter of suggestive titles on the model of the first—“Liam and the Wild Fairy”—for six more stories. My notion at the time was a story sequence rather like The Abode of Bliss. That is, seven separate stories which, although all concerning the same character, would not possess the kind of plotted through-narrative expected of a proper novel. That remained my notion as I wrote the next two Liam stories, and as they were published in (the late lamented) Icarus: The Magazine of Gay Speculative Fiction. I made a start on #4—we’re getting into 2011 now—and, as too often happens, the project went comatose on me. This past January (2014), I took another look at #4…and completed it in a mad, overcaffeinated, insomniac rush. It was still a story, though, a distinct entity, if nearly twice as long as any of the first three. You can read the first draft here. Then I intended to do something different. But because my muses are nothing if not unbiddable, in another mad rush I composed a fifth Liam “story,” which—among other things—made clear to me the book wanted to be a real novel and that it would be a good deal longer than the slender 35,000-word volume I had originally envisioned. Nearly twice as long, as it turns out. I am very pleased with it.